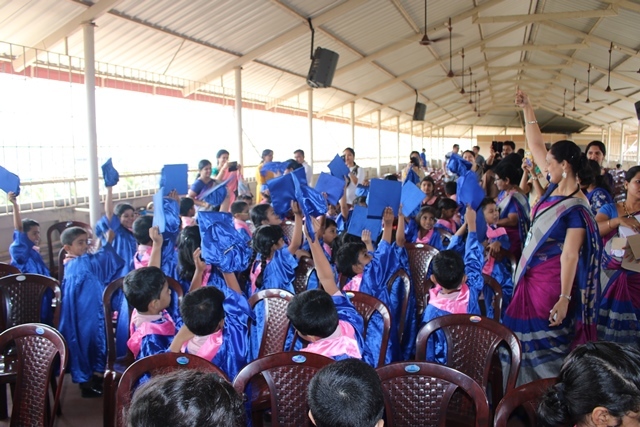 As the Kindergarten students walked through the isle of the Roof Top Auditorium in their dazzling blue gowns and the graduation caps before their teachers and the heads of the institution, it was a mini carnival to the parent audience who were eagerly watching their children with dreams and aspirations for their bright future. 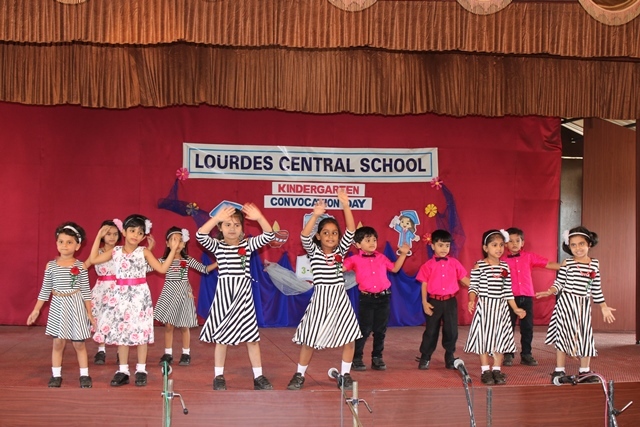 With a quote from William Shakespeare, ‘Small cheer and big welcome makes a merry feast’, the little angels welcomed everybody gathered in the auditorium for their convocation ceremony. 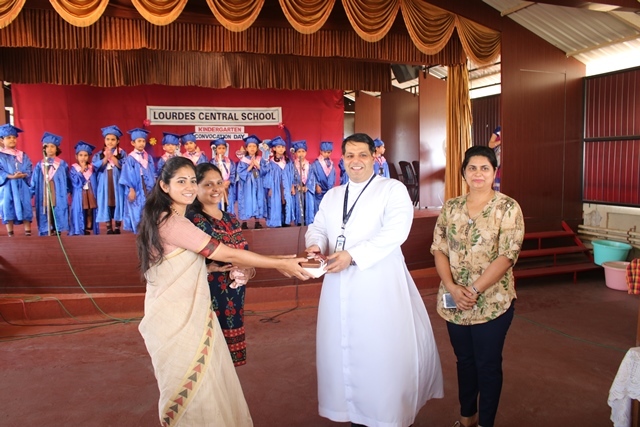 Ms Lydia D’souza the Kindergarten co-ordinator, welcomed the Manager of Lourdes Central School Rev Fr Wilson Vitus L D’souza , the Principal Rev Fr Robert D’souza , Vice Principal Ms Belita Mascarenhas and chief guest Professor Sukanya Rao, after which the dignitaries conferred the personalized trophies and certificates to the KG-2 graduates. 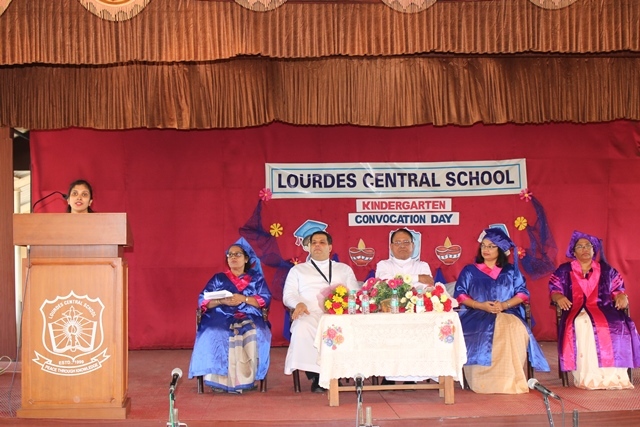 The Chief Guest congratulated the gratifying pre-primary teachers and the joyful students in completing their first level of education. 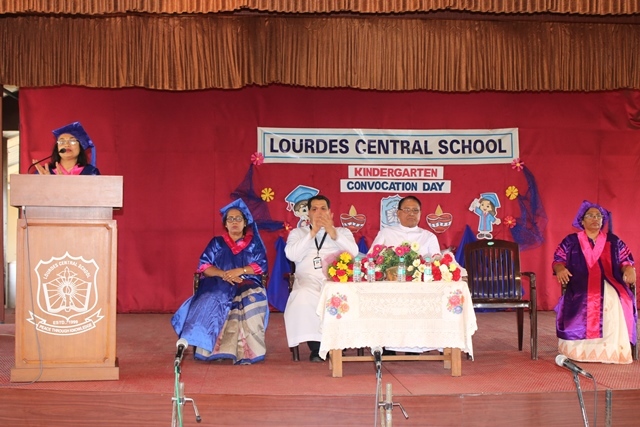 She advised the children to be happy in the primary section and suggested the parents to spend one hour everyday with their children, switching off all the electrical gadgets and focussing only on their children. 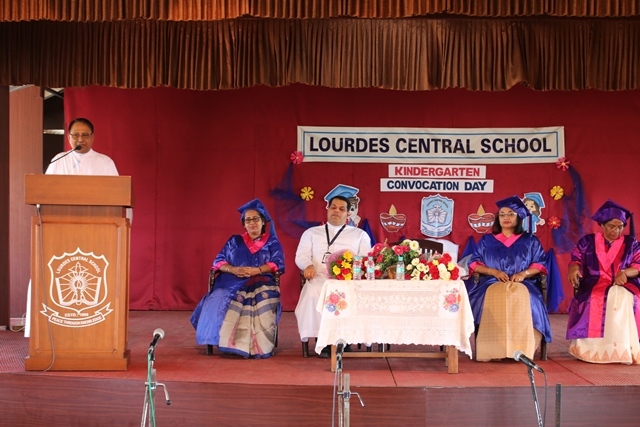 Rev Fr Wilson Vitus L D’Souza thanked every parent for trusting in the institute and enlightened them of their duty towards their child in protecting them emotionally and physically and helping them grow in intelligence and spiritually. Fr Manager also advised the parents not to underestimate their children and appreciate and praise them in the little things they do. 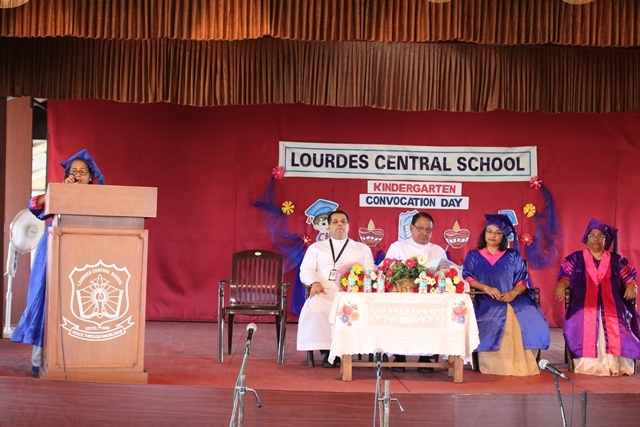 The Principal too appreciated the goodwill of the parents and thanked the PTEC for their contribution towards the school’s betterment . Parents Ms Apoorva, mother of Daksh , Ms Sonali Prabhu, mother of Dweech Prabhu and Ms Rashmi Lobo, mother of Nicole Miranda, reminisced the glimpses of the kindergarten journey along with their wards and expressed their feelings and brought out the complete change, their children went through in the elementary section. 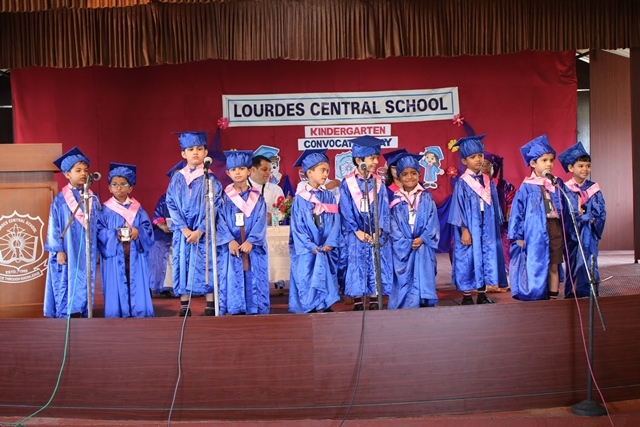 Amora Mitchell Vaz, Eathen Samuel Fernandes and Pranamya Kotian, the outgoing students of KG -2 spoke their heart out and refreshed their two years memory at the kindergarten section.The junior students sang a wishing song to their seniors and shook their body for a lovely farewell dance song, which was choreographed by Charan Sir and the song by music sir Mr Roshan. 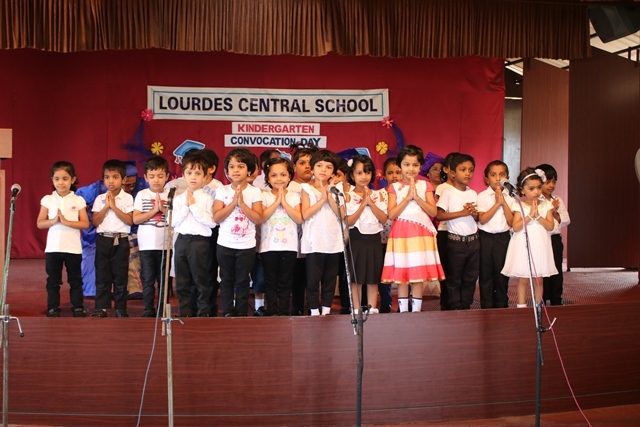 The KG-2 students also delivered the vote of thanks , thanking the comperers Ms.Francisca and Ms Mini, teachers of the primary section. 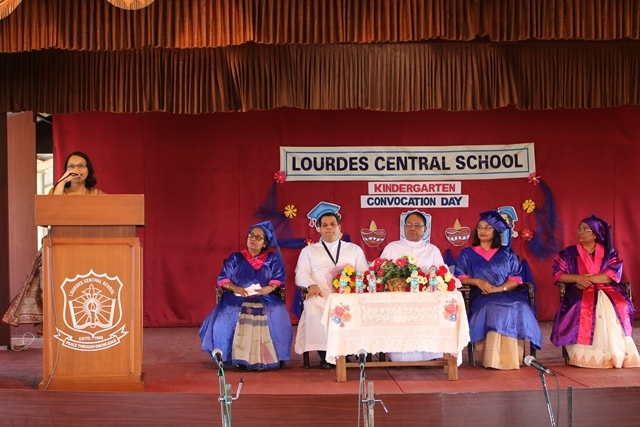 The convocation ceremony concluded by singing the National Anthem.